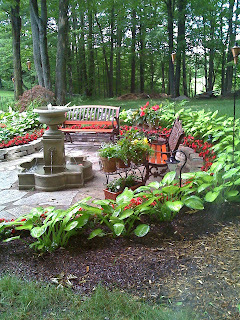 This year (2010) I Promised myself to get out and have fun with my backyard garden and to make changes....I've added lots of hostas, relocated some, planted new hydrangeas and lilies. I also added a climbing rose and a clematis to the arbor along with a seasonal dose of morning glories! My goal was to be thoroughly satisfied with myself for accomplishing what I set out to do and to keep that spirit through the long winter months that will be ahead! I moved these pedestals to the entry of the fountain area. The potted impatiens have done really well this year. Side view from the backyard of the fountain area... 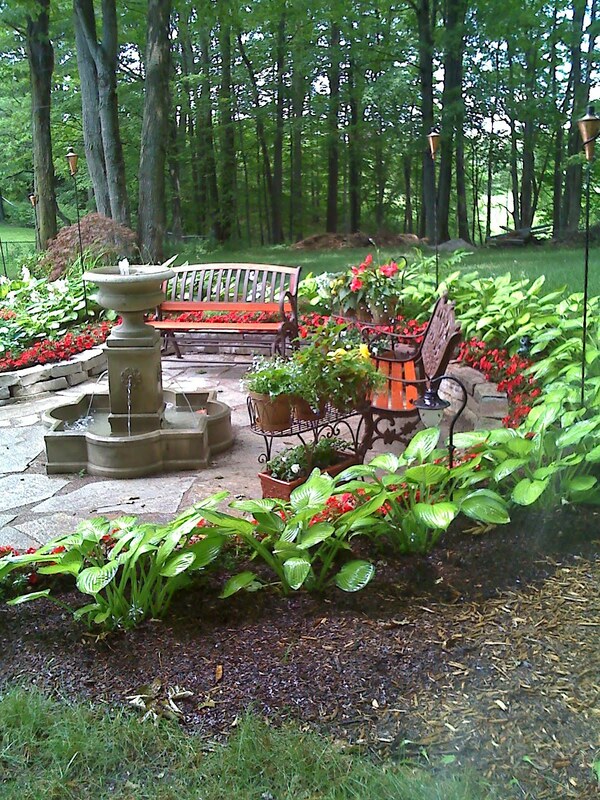 I put red impatiens around this year so it would stand out nicely (last year I used soft pink, but they didn't catch your eye as well)...the hostas were all split up and placed around the perimeter last year from plants I already had. New this year, a goal of mine to successfully grow roses, this is my new Queen Elizabeth (Grandiflora) Rose. I couldn't be happier with it. Not too fussy and produced beautiful flowers! Creeping Jenny spreads out nicely, fills in all the cracks and the underneath of other plants, but can easily be removed. I am totally in love with Limelight Hydrangeas...they produce such attractive long lasting flowers..I planted three of these along the edge of my side path that goes out to the birdfeeder. These morning glories are making a beautiful display...very nice to see every morning! I have had so many great flowers this year with the lilies, peonies, tulips, iris and the annuals I have planted, I am very satisfied with my goals being met in the gardens! Everyday I go out to see if there is anything new, anything to take care of and to consider anything I should do differently and make changes to. I always have goals, I'm rarely satisfied to leave things alone for long!